Ice chest? Ice cooler? Ice box? What ever you call it you need one! And there are all types to choose from! It is time for football which mean tailgating. Also with this wonderful weather comes outside parties, and tubing down the river… which means lots of cold drinks, which means lots of ice, which means you need something to keep your ice and beverages cold! Through out the years I have seen people use some strange things to hold their ice and beverages. A bath tub (and I mean a working bathtub) in the living room was probably the weirdest and that was in a penthouse in Houston, TX. Beach parties always call for the garbage can punch which holds the beverage and the ice. Kiddie pools are another favorite. Keep your cooler has quite a selection of coolers. Check out their selection. They have everything from backpack coolers to wine coolers! Igloo has ice chests with wheels which is very handy when going on a picnic or to the beach. 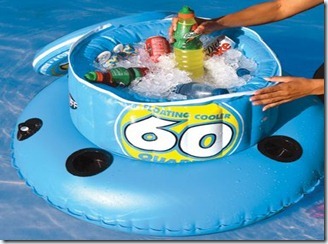 There are coolers you can carry, push, pull and float. My friends have use wheel barrows, galvanized tubs, and kiddie swimming pools, and their kitchen sink (which is actually a very good idea for many reasons). So the question is, what or where do you put your ice when you have a party? Come on show me some of your neat “coolers”!!! I think it is about time I go shopping for a new ice chest.